Reyne Haines talks about the history of art glass, and about collecting art glass from designers such as Tiffany, Loetz, and others. Based in Cincinnati and New York City, Haines is a 20th-century decorative arts appraiser, collector, and dealer, who also appears frequently on Antiques Roadshow. She can be reached via her website, Justglass.com. I started becoming interested in art glass when I moved from Texas to New York, and wanted to decorate my apartment with New York-type things, things I had never seen in Houston. I grew up in Texas, which is a relatively new state. While there’s a lot of money in Texas, we didn’t have a Tiffany’s, we didn’t have a Marshall Field’s, or companies that sold Baccarat or Lalique or Tiffany or Steuben or any of the bigger makers. Nobody in my family really collected anything, and I wouldn’t say I was an antiques enthusiast when I moved to New York. But when I got here, if I saw something in the window of a store, and I thought it was attractive, I would go inside and look around. And if I could afford it, I bought it. This was the early ‘90s. She was surprised – most people who have art glass have inherited it, or they know what they’re looking at. People don’t just go and buy stuff in quantity on a whim just because they think it’s pretty… which is a shame, because it’s really what you should be doing. The next thing you know, she brought me a couple of books, and started showing me things because she happened to be a collector. The more I looked in some of the books that she gave me, the more interested I became. And then like every other collector who starts by just collecting everything, I started to focus and understand the difference between quality versus quantity. Collectors Weekly: Can you give us the abbreviated history of art glass, back to the 1890s, the 1880s? Haines: It goes back further than that. Take a look at Roman glass made during the Roman era. That’s some of the glass that inspired makers like Louis Comfort Tiffany and Johann Loetz during the Art Nouveau era, that iridescent glass that became iridescent from being buried for so many years. They had seen that in museums, that iridescent luster you find with Roman glass definitely inspired some of the Art Nouveau artists. The Art Nouveau period was all about organics and nature. It was also very garish, with iridescent colors and bright blues and golds. When the Art Deco era came into favor, that all disappeared, everything went to clear crystals or pastel colors, lighter colors, geometric designs. It was no longer about nature and inspired by organic-type things or Japanese-type things. Collector Weekly: How did the modern art glass era get started? Haines: You didn’t really see machine-made glass until about the turn of the century, so most art glass is made by hand. It wasn’t commercially produced. Basically it was just another form of art, that happened to be glass. Art Nouveau, meaning new art, was just a departure from the colors and the styles of the Victorian era. Glass was also functional, and it had been functional all the way back into the Victorian era. The Victorians were known for making wonderful fingerbowls and wine decanters, wine glasses, water glasses, pitchers, orange juice sets, things of that nature. So both utilitarian and decorative. Even Louis Comfort Tiffany was making things for the dinner table. A lot of people don’t know that. They think of his wonderful vases and lamps and windows, but he did utilitarian things. It wasn’t his favorite thing to do, but for years Tiffany made bowls and plates and glasses and tumblers and decanters. After the early 1900s, at least here in America, there was a void in the art glass world. We’ve got many wonderful contemporary studio artists now, for example from the Pilchuck School, which Dale Chihuly formed. 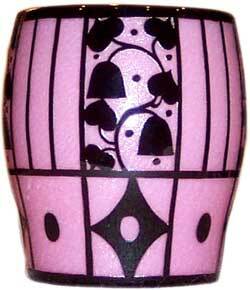 But for many years there was a lack of American artisans working in glass after the Art Nouveau era ended. 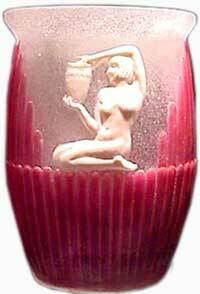 By contrast, great art glass continued to come out of France, for example Lalique, Daum, Baccarat. And from Sweden like Orrefors, Kosta Boda. And of course the Italian masters on Murano had been making art glass for centuries, generation after of generation. But the tradition was lost for some reason here in America, until the late ‘50s and 1960s when people like Harvey Littleton brought it back again. Collectors Weekly: Who are some of your favorite art glass artists? Haines: I’ve not really seen that much glass that I didn’t like! There’s certain glass I like in my kitchen, or on the vanity in the bathroom, or on the shelves in my collection. I’m a real mixed bag. There are lots of collectors who really focus on a single artist or era, or are only perfume bottle collectors, for example. They may collect Steuben perfumes, Tiffany perfumes, Italian perfumes, Lalique perfumes. But they just stick with perfume. And then there’s me… I have a little bit of everything. I’m a huge fan of Loetz glass and have been for many years. I kick myself because early when I first started collecting and dealing, I realized Loetz glass was undervalued in America. I thought to myself, I really should buy every piece that I see. I thought, if this had a Tiffany signature on it, boy, it would be a lot more money. I ended up buying a handful of pieces, but I passed up a lot of things, and now 15 years later I’m very sorry because Loetz made its name here in America. Loetz made some glass that most certainly would rival that of Louis Comfort Tiffany and Fredrick Carder of Steuben. 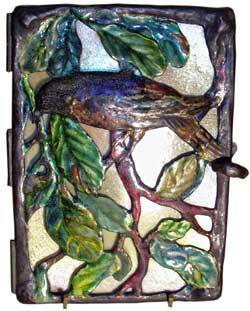 I love Tiffany glass too. I love most designers from the Art Nouveau era. I’m not a huge French glass fan, but I do like early pieces of Galle, enameled pieces, maquetry pieces. French cameo glass I don’t particularly care for. 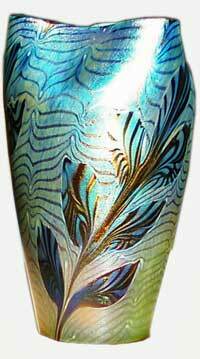 I love Thomas Webb & Sons, an English maker of art glass, though they’re more Victorian era than Art Nouveau. Wonderful, wonderful works came from there and from Stevens & Williams, their competitor during the same time period. Contemporary glass, I have to say, I love Dale Chihuly. I had the opportunity to meet Chihuly several years back, I was going to a private dinner and he was going to be there. I thought to myself, I really don’t want to meet him. He’s just the Thomas Kinkade of the glass business, churning it out for the masses. And he doesn’t even make it himself, other people do it for him. But on the way there, my husband reminded me that Louis Comfort Tiffany didn’t blow a single piece himself either, he was purely a designer who had a very good eye and knew what he wanted. If he didn’t like something you make, he had no qualms of breaking it and making you start all over again. It turned out I ended up sitting right next to Dale Chihuly that night, and as I talked with him, I learned he knew a great amount about the original glass masters. And some of the people he had studied with over the years. He’d gone to Murano and worked with these second and third generations of artisans and then worked with Harvey Littleton here in America. I was really mesmerized by the level of knowledge he had. I walked out of there completely inspired by his story. Needless to say, some of the things he’s done have stimulated the art glass world, by making contemporary pieces more accessible and through his marketing skills, by what he’s done on television. It’s exposed people to things that they’ve never been exposed to before because they’re not collectors. He has really won applause for museum curators around the world. And he’s got things on exhibit, not just in museums, but for example, the Bahamas in the Atlantis there’s Chihuly all over the place. It works really well within a setting like that. You think, okay, casino art glass? But the kinds of things he’s designed for them work really well. It makes people stop and think. Collectors Weekly: In terms of collecting, which styles and periods do you like the most? Haines: I like Art Nouveau and I like Modernism – mostly the 1950s, 1960s, Scandinavian and Italian glass artists. I also collect form other periods. I collect American and French impressionist paintings. I collect fine time pieces, enameled jewelry, Navajo rugs, Arts and Crafts furniture, leaded lamps, reverse painted lamps, art pottery, sterling silver, textiles from the Arts and Crafts era. The connecting theme is visual appeal and how it will work in my home. In terms of art glass, I think the younger generator today likes Tiffany and then a lot of modern glass. Tiffany really only did Art Nouveau. Towards the end he started making Art Deco things as that movement started to come into favor. It’s something he couldn’t stand having his name attached to, and it’s not his most popular work, but the head of the department was trying to keep him the leader in art glass in America, trying to change with the times. And Louis Comfort Tiffany just wasn’t interested in changing. Remember that Tiffany didn’t mass produce anything, it was all hand done. I have absolutely no idea what their production numbers were. At one point, their studio caught on fire, and all of their records were lost. But there’s enough out there – it’s readily available. It just depends on the level of the piece, the rarity of the technique, like anything else. Some of the artists who worked for Tiffany left to start their own companies, and they would just last for just a few years. So you’ll see similarities in other designs to Tiffany and maybe at first glance you think they’re Tiffany, but they have a different name and signature. Like Martin Bach of Quezal. American art glass collecting has really grown in the past twenty years, the market has really expanded. So pieces get taken off the market. There was a time in the ‘80s and early ‘90s when you would see the same things every year or two, they would come back on the market. You don’t see that anymore. You begin to wonder what became of them. It’s much bigger than it was before, but not really more global. You rarely see pieces come up abroad, and when you do, they just don’t command the same kind of money. The Japanese seem to have stopped buying Tiffany, they’ve moved into mostly modernism glass and modernism things. Italian and Scandinavian glass. Collectors Weekly: What advice would you have for new art glass collectors? Haines: Buy what you like. Just because you’ve read about something in a magazine or in the New York Times, don’t buy it if you don’t like it, because there’s nothing to say the market for any of these things will still be there tomorrow. Yes, there’s a long term trend, but if tomorrow you’d find that people are no longer interested in buying Loetz and you have a shelf full of it, what good is it going to do you? But if you bought it because you like it, you still like it and want to keep it. I have a few pieces in my collection I like more than anything else, that it would be really hard to part with. A Tiffany piece and a Loetz piece and a piece of Webb, mostly because of the circumstances behind how I acquired them. I’ve always liked experimental-type things. When the artist is thinking outside the box, that’s what attracts me. A lot of people use the word textbook Tiffany. They want to own something they can see in a book. I don’t want to own something I can see in a book. I don’t want something that my friends will say, “Yes, I had one of those,” or “I had three of those.” I want something that if a collector comes to my house, they look at it and they scratch their head and go, “Who did that?” I want something that’s different and unique. New color, new shape, new technique, something that maybe went wrong even. I like Titania, which are paperweight type pieces, and not what most people think of for Loetz. In Tiffany, I like certain shapes. I’ve got a handful of ball-footed pieces and vertical stripe pieces of Loetz which is their transition into the Art Deco period. I just like the little ball feet. I like the stripes going up and down. I like unusual color combinations. The other thing I tell people is that quality is better than quantity. Especially if you are collecting also as an investment, it’s best to not have four of those but one of these. A lot of people will tell me, “I can’t afford that.” Well, yes you can if you sell these five other things that you have, you could have this one. So think about a budget for yourself and then go buy the best that budget will allow instead of buying as many as that budget will allow. The final thing I tell people is condition, condition, condition. If it has a scratch, or a chip, if you absolutely have to have it because you’re in love with it, I’m sure you’ll pay accordingly. But if you’re looking to buy for investment purposes, it’s best to walk away and wait until one becomes available that doesn’t have a problem. Collectors Weekly: What about shows or where people can go if they really want to learn about art glass? Haines: A great show is coming up in January, the original Miami Beach Antique Show. There are a lot of art glass dealers down in that show, including myself, but it’s pretty much the biggest and one of the best antique shows that comes to this country once a year and has for 20-some odd years. There’s a thousand dealers from all over the world selling everything you could imagine. But if you are looking to learn or invest or begin collecting art glass, there is a very big barrage of things in which to choose from at all different price points. And who can complain about being in Miami Beach in January? The other shows I’d recommend are the Pier Show in New York that happens two or three times a year, and the Labor Day weekend show in Baltimore, the big Baltimore antique show at the Baltimore Convention Center. And there are also some great art glass exhibits in regional museums that are worth checking out – for example The Toledo Ohio museum, the Richmond Virginia museum and then Tacoma, Washington. I thoroughly enjoyed reading your article…your interest in art glass coincides with my personal enjoyment. I began collecting “marbles” about 18 years ago — now I have more than 300,000. I’m a private collector and would be interested in relinquishing them. Do you have any suggestions? I have a pair of Steuben Aurene 7 in. perfume bottles # 3294. Where can I go to have them evaluated? I live in N Florida. recently purchased a medium sized heavy ice bucket-the note on it said “made in Ireland and signed”. It looks Scandinavian to me-very contempory- and the signature seems to be Stromhyskyttn 1910. What did I buy? Hello, trying to gather any information I can on a Kosta Boda complete chess set by Kjell Engman. The chess board was 3-dimensional elevated handmade out of wood. The article number was 7099499. Awesomely unique, and would have to be a collector’s item by now. Approximate time would be early-mid 1990’s. thank you for any help you maybe able to provide! So, how do you feel about contemporary artists like Duncan McClellan? Hi Donna – Thanks for posting. Unfortunately, I do not follow the contemporary market much. I have never seen McClellan’s work. Tell me more! “ ” If a woman received gloves for Valentine’s Day and she wore them Easter Sunday, it was an acceptance of a marriage proposal.